Wal-Mart Purse Snatching, LIVINGSTON, May 7, 2008 - According to Lieutenant Matt Parrish of the Livingston Police Department, a lady had her purse "strong-armed" away from her by a white male who was reportedly 30 to 40 years of age, balding, between 175 - 185 lbs., and about 5 ft. 8 inches tall. 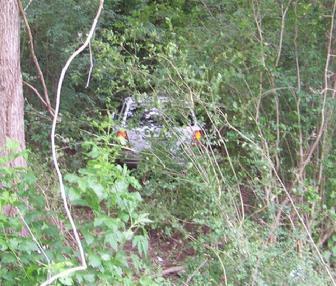 The man took the keys to her vehicle and jumped in and drove away in her car. Witnesses said the man drove under the 59 overpass and turned by Whataburger and proceeded to a vacant wooded area by "Tons of Fun" where he drove the vehicle into the woods and then abandoned the vehicle. A manhunt was put into operation, however at time of press, the suspect has not yet been apprehended. 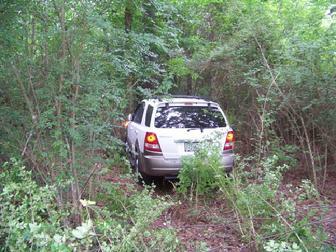 The suspect dumped the vehicle in this wooded lot by Tons of Fun.